The Mona Plant Irrigation Watering System Link 24 has been designed to provide efficient, cost effective tree and planter irrigation solution. The links act as a reservoir to hold water and distribute to the plant's roots as and when required. The Mona Plant System is a 100% water efficient, subterranean plant irrigation system, ideal for landscaped areas, hard to access areas and highly trafficked areas. It is versatile with a variety of applications. The Link system is also very effective when looking for a larger planter watering system, where multiple tanks can fit and be linked together in one planter with one inlet. The perfect watering system for installing in urban tree planting projects or for install during planting shrubs in large planters. The Mona Plant Irrigation Watering System Link 24 has been designed to provide the most versatile of the Mona watering systems along side being efficient, cost effective tree and planter irrigation solution. The links act as a reservoir to hold water and distribute to the plant's roots as and when required. 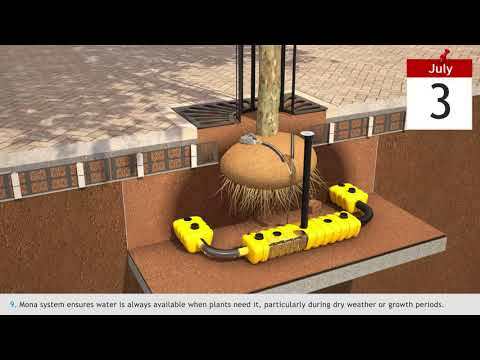 The Mona Plant System is a 100% water efficient, subterranean plant irrigation system, ideal for landscaped areas, hard to access areas and highly trafficked areas. It is versatile with a variety of applications. The Link system is also very effective when looking for a larger planter watering system, where multiple tanks can fit and be linked together in one planter with one inlet. The perfect watering system for installing in urban tree planting projects or for install during planting shrubs in large planters. Each yellow tank is connected via a flexible pipe allowing for any configuration of link system to be built into the specification.